PC/Notebook usability rating: 5/5. About 3 minutes to finish, 1 open question, a receipt is needed and clean page. Tablet usability rating: 4/5. No mobile page for Tablet. 1 open question and you need to enter personal information. Smartphone usability rating: 4/5. No mobile page for smartphones. 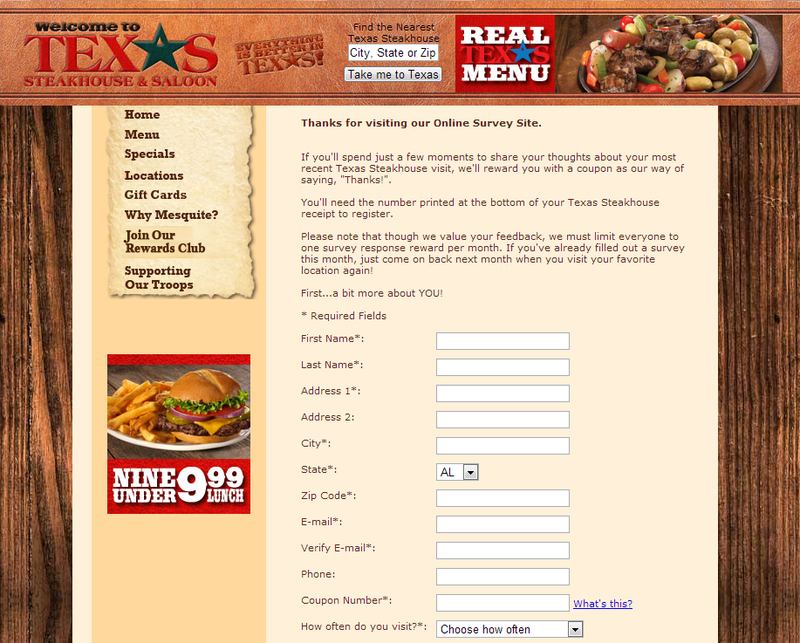 You can still finish Texas Steakhouse Online Survey via smartphone and it may take you more than 3 minutes to finish. 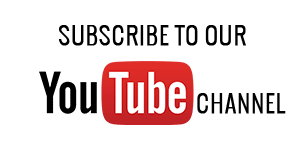 Visit the Texas Steakhouse online survey official website and enter information about yourself such as your name, address, email date and time of visit, etc. - Login to your account to view your point balance. Vouchers will now be automatically updated on your Card when you reach 200 points. - Two $10 vouchers when you accumulate 200 points (Vouchers will automatically be available on your card for your next visit). - FREE gift on active members ' birthdays. - Exclusive members-only offers and events. We visited Texas Steakhouse in Rocky Mount (Target location) on Apr. 15. AC not working. Service wonderful. Food great. Miserable meal. One got sick and had to go outside. The rest of us carried most of our meal home after eating salad. Called April 22. Not fixed. Called Apr 22. Not fixed. Called Apr. 29 RIDICULOUS!!! Wish someone at corporation would reply. My sister and I went to dine at your Princeton, WV Texas Steakhouse last evening (9/21/15). I have always been treated with a very positive approach in the past and enjoyed everything about the meal. Last evening the waitress we had did not give us her name, took our order which was 2 12 oz. New York Strip steaks with salads and baked potatoes. I also ordered a side of Mushrooms and 1/2 appetizer of Onion Petals. Later the waitress sent another co-worker out to tell us that she was trying to check out other customers. We did not receive our appetizer until the steaks came out and we did not receive our salads until I mentioned them to the waitress after our meal was done. We never received our Mushrooms either. The waitress only said she was sorry but made no attempt to make this right. I will be very hesitant about visiting this establishment because of this incident. I was very disappointed at a lunch visit today 4/17/15. A group of us from work went to Texas Steakhouse in Martinsville, VA for lunch and called ahead with a head count of 11. We were promptly seated, which was great and the waitress was gracious and friendly, however, it took an hour to get our food. Please be mindful that we only get an hour for lunch and the restaurant only had a few patrons at the time of our visit. When we had waited about 50 minutes for our food I asked the waitress what was holding our orders and she said they were a little behind. I would call this a lot behind. Once we received our food, everything was delicious and again the waitress was very nice and courteous. Our group would like to visit Texas Steakhouse again for lunch but probably will not due to the length of time it took to get our food. Our 1 hour lunch ended up taking 1 hour and 45 minutes. I find this to be totally unacceptable and feel that the restaurant should be more prepared for people coming in for lunch that are on time limitations for lunch. The food was wonderfully tasty and the service was superb! front service was great but it took the cooks a long to prepare the food and I when I tasted it. I knew the cooks needed to switch to washing the dishes and the bust boys cook the food. I went to Texas Steakhouse on Feb.16,2015 an the Ribs were great. They were worth the money. They are way better than Outback's. has excellent customer service skills, my husband and I was pleased!!!! food very good and service excellent. Great service and food was nice and warm even being take out. I took the survey and it showed completed successfully. How do I get the $5.00 coupon? Good food and plenty of it. Could not finish ,left food on plate. Waitress was incompetent. 3 of 4 in our party had a problem with order. Did not bring appetizer until we asked. She very obviously had forgotten. Steaks were not cooked as ordered. Would have sent them back...but waitress was nowhere to be found. I took the survey. for a $5.00 coupon 801328814350780 It registered, how do I get the coupon? Just had lunch w/ friends at Texas Steakhouse...The steak was not up to your standards. It was really tough and overcooked....Will be a while before we go back. Texas Steakhouse is always enjoyable..no matter where I go in the state of N.C. It was a very good experience. Kris was our server and he was very good to us. He remembered us from our last visit, which was a really nice touch. He was busy, but would always stop by our table to make sure everything was fine. We will ask for him whenever we go back to the Danville, VA location. Our food was very good and we had great service. Tanikia gave us great service. She was very attentive, courteous and knowledgeable. Very pleasant visit. Service was real good today but asked for more napkins and never received. Food was excellent. Cindy 762 our wait -person was very knowledgable and very professional. We celebrated a friend's birthday there, and enjoyed it very much. The waitress was very cordial, helpful and concerned that we had everything we needed. The food and the service here in New Bern, NC is wonderful! We went to the Steakhouse in New Bern, NC store 8020 check number 3703. We had to wait for 45 minutes for our meal and the food was barely lukewarm. Flavor was good as well as the quantity. Tables were all very sticky from years of wiping with Clorox and not refinishing them. Everything including my new long sleeve shirt stuck to them. something needs to be done to correct this issue. We thoroughly enjoy our local restaurant and all the employees particularly 644 David. The food is also delicious. Use to go to Texas about once a week. Really enjoy your two for $20 ribeye specials. I realize that prices go up, but since the Texas in Roanoke Rapids, NC has changed hands it is not enjoyable to go to anymore. The service is not as good as it use to be, and the food is not either. Had a real bad experience the other day. I'm not saying I'm not going back, but it will be a while. Visited Rocky Mount Texas Steakhouse 4/12/14. Super meal and great service from girls at bar area. I recently visited your steakhouse in smithfield NC with a group of people. The service was terrible however I think it was the kitchen at fault. It will be a long time before we return. Service is too slow and a steak not cook as customers order.